As many as 65 drivers have been found positive for drugs after nationwide spot checks according to the Ministry of Public Security. 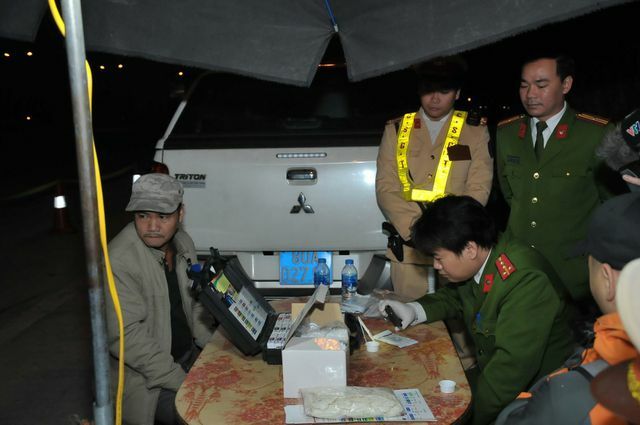 A report from the ministry said that three provinces of Lai Chau, Binh Phuoc and Thanh Hoa had the highest number of drug-positive drivers during January 21-30. Inspections for alcohol and drug-positive drivers are being carried out during and after Tet Holiday on passengers buses of eight seats and over and trucks. Drug use is high among commercial truck drivers in Vietnam as amphetamines and cocaine are said to help them stay awake. Police checks have revealed many drivers are using drugs. The drivers said they knew about the dangers of driving under the influence but they had no other choice due to the high-pressure deadlines they were operating under. Driver Phan Hau from Phu Yen Province revealed that because of the high demand for drivers to transport dragon fruit trucks to the Chinese border, businesses will hire inexperienced drivers for long-distance trips. "The company should hire two drivers but in order to cut corners, they only hire one and this driver will find an assistant at a cheaper price. On the north-south trips, the main drivers only work during the 'best hours' and let the assistants drive at noon and night. The assistants often use drugs to stay awake," Hau said. Four people were killed and 18 were injured when a truck ran into dozens of motorbikes waiting at a red light in Long An Province on January 2. The driver in the case tested positive for alcohol and drugs. Statistics from HCM City Police Department show that there are 23,508 registered addicts. Major General Phan Anh Minh, deputy director of the Police Department, suggested tightening management with stricter punishments. Currently, firms only have to bear civil liability when their drivers cause accidents. The regulations should be revised so that firms and vehicle owners face criminal responsibility when using addicted drivers or allow overloaded buses or trucks. Another inspection will be carried out from February 11- 20.